For those of you interested in overseas property that haven’t read this week’s Irish Farmer’s Journal, it may be well worth a look. This will particularly be the case if you have invested money with Castle Carbery Properties (account suspended last time I looked), run by farmer Mick Scully, from Co. Cork. 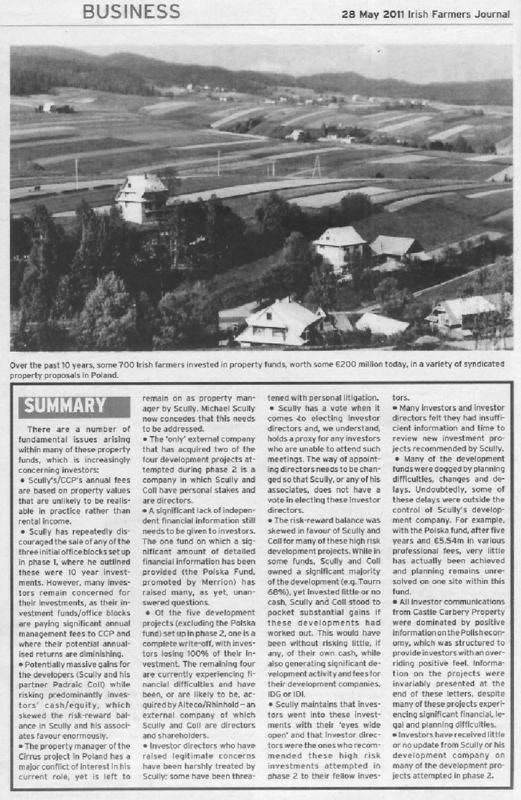 The piece is interesting for a number of reasons, the most obvious one being that it asserts that Castle Carbery Properties funds in Poland are pretty much all under water at this stage and this has led to an obviously large amount of soul searching amongst the farming community, which was very heavily invested in a number of them. It has also directed a number of accusations toward Mick Scully and his partner in Poland, Padraic Coll – essentially saying that they had been structuring deals in a way that was vastly more favourable to themselves than their investors. You can see a summary of the piece below. If you want to read the whole lot then you’ll have to get your hands on a copy of the IFJ as it is not available online and as it is a full three pages long I can’t really reproduce it here. The other reason this story is interesting is that Mick Scully was long the darling of the property and investment pages of the IFJ. His company was probably featured there more often than any other, so it is interesting that the newspaper has now decided to ‘out’ his company. It is the first instance of an Irish newspaper admitting that it perhaps presented information in a ‘less than balanced’ way when projects were being promoted. In fact, Scully was to a large extent quoted verbatim when such projects were highlighted. It is interesting when you compare this to the complete abdication of responsibility in newspapers like the Sunday Independent, who featured companies such as Larionovo and Prunty’s Overseas Properties on it’s Property Section front page virtually every second week. The paper was notoriously silent on the issue when Larionovo went into receivership and has never mentioned the fact that Pruntys appear to have shut up their Harold’s Cross and Cork offices, along with their website, completely. The final reason it is a very interesting exposé is that the writer, Brian Leslie, claims that he has “tried to examine and present the facts in an open and balanced way” when he has done anything but. It is a very obvious kicking for Castle Carbery Properties, with no effort at all at giving the company’s side of the story. I can’t say that Castle Carbery Properties does or does not deserve the bad press, I don’t know the specific details of the issues involved, but to say that this is a balanced piece of journalism is simply incorrect. Here is the summary – you can click on it to enlarge it and then click on the ‘Back’ button on your browser to return to this page. 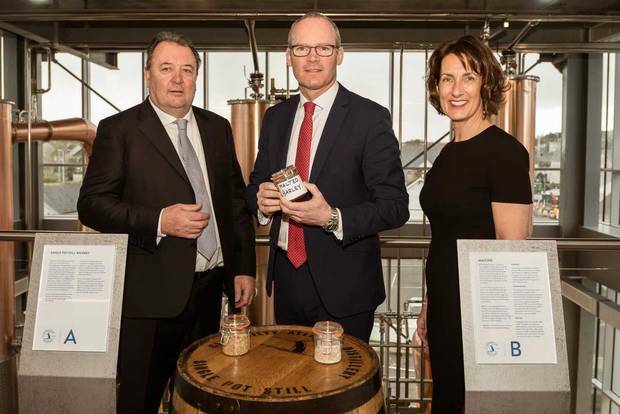 Coveney said that the distillery is “the latest example of the strength and ambition of local enterprise and of the Wild Atlantic Way brand”. “Ireland needs people like Michael and Helen Scully, who have the vision and drive to help to create viable industries and the jobs that come with them,” he said. I’m not certain that everyone would agree with Mr. Coveney given the Scully’s track record in the property industry. As you’ll see in the comments section below, a lot of people are querying where the significant funds required to launch the distillery project were sourced. Many investors gave money to Scully and Coll and have had none of it returned. Interesting article!! I am an extremely disapponted investor in Castle Carberry Properties. Do you have recent articles? I now have worthless shares in Alterco and cannot grasp an understanding of the structure and why a significant portion of my shares are not even tradeable. Hi Doreen. 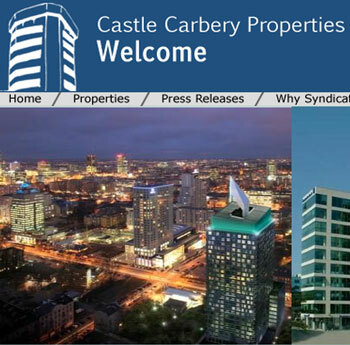 I believe Brian Leslie has written further articles on Castle Carbery Properties investments in the Polish market. I’ve not seen them to be honest, but the gist of the one featured here would indicate that they were probably less than balanced as well. Having said that, I offered Michael Scully a right of reply on this article and he refused it outright. I got the impression he was attempting to bury his head in the sand hoping it would all go away, but of course it will not. The ongoing drawing of large fees on property funds when those funds are performing poorly, or not at all, becomes a very thorny issue with investors. Michael Scully and Padraig Coll are not the only ones being castigated on this front. Practically every bank in Ireland has a fund that is under-water (latest newsworthy AIB one here – http://bit.ly/UZIXbx) and Eddie Hobbs has also been pummelled for the fees being drawn down by Brendan Investments directors at a time when the fund is not performing at all well. HI, I am also a very unhappy investor with Michael Scully and Padraig Coll in Castle Carberry properties. Many Irish people invested millions of Euros in a Polish property scheme called Torun, that was promoted and operated by Mr Scully and Coll. After 10 years, there is no return to the investors, no development, and Mr Scully and Mr Coll have declined requested meetings with the investors about what is the status, and what they are doing with the millions? Separately it does appear that many millions are being invested in Mr Scully’s latest scheme for a whiskey distillery in Clonakility. How did the whole investing occur? Can you share details? Like, were you signing loan agreements, buying shares? I invested in zakopane. Seems our friends in Cork are living the high life on our money. scully a one time friend needs to look in the mirror of his S Class merc and come clean once and for all. I feel very angry about the whole thing. He appears to have washed his hands. I can’t afford to but if I could I would bring him to court for fraud. I’ve heard these guys are making millions with their new whiskey venture. Fair play to them for putting this unfortunate mess behind them. They will undoubtedly come good again, cream always rises to the top. Scully & co collected millions for his failed projects yet paid himself hansomely. I am in contact with the fraud squad to see if they can trace his companies in Cyprus Poland Netherlands etc. Big ?? ?where did he get the money for the distillery .